The world's easiest-to-deploy touch-tone payment solution. Welcome to the new gold standard for payment by phone. Compliance - recordings often need to be paused to protect sensitive customer information. However, this can create issues with compliance and audit trails. If there is a break in the call recording when the payment is being made, the merchant has no evidence of what has occurred during the actual transaction. Customer experience - if a customer is forwarded to an automated facility to process their payment and they experience issues, there is a risk that the customer may abandon the call, resulting in a lost sale. Ensuring the customer has support throughout the transaction makes for an easier experience, maximising the chances that they'll complete the payment. Privacy - protecting your customers' payment details is paramount. Without adequate protection, your organisation is at risk of massive reputation loss in case of a data breach. Therefore, it is important to have a payment processor that removes the opportunity for the customer's card details to be captured by the agent. We achieve this by eliminating specific visual information and audible tones whilst transacting the payment. pcipayspace is our cutting-edge payment processing solution. It enables you to get on with what's important - taking payments efficiently, maximising your conversion rates, and minimising IVR abandonment. Never have to worry about PCI compliance again. pcipayspace manages compliance for you, eliminating the red tape that's preventing you from achieving the best-possible results. The solution is tier-1 certified PCI-DSS compliant - customer information is protected as card details are transferred. At the same time, the call recording is maintained, ensuring you have a complete record of the transaction for future reference. Guide customers through the payment process with the help of an agent, or automate the process using IVR to collect payments more efficiently. You have complete control - edit user roles, call flow logic, and payment protocols from the comfort of the admin dashboard. pcipayspace is also compatible with contact centre software other than contactSPACE - you have the freedom to build your perfect solution. Collect payments with minimal delay. Transactions are instantly submitted to the Australian banking network, ensuring lightning-fast confirmation. If the customer makes a mistake as they input their details, agents can restart the process with the click of a button, and the IVR is also easy for the caller to reset. Monitor and improve performance through our comprehensive reporting module. Keep on top of payments in real-time, or produce your own customised reports to monitor the metrics that matter to you. Developing insights is easy - whether you're looking to assess agent/campaign-specific results or monitor overall performance, pcipayspace has all the answers. After initiating a payment, the customer is transferred to a secure line, whereby keypad tones are muted on the agent's end, but the call recording continues. The customer then inputs their card details through the keypad. The agent can confirm the validity of these inputs as they occur, without ever seeing the actual card number or CVV. 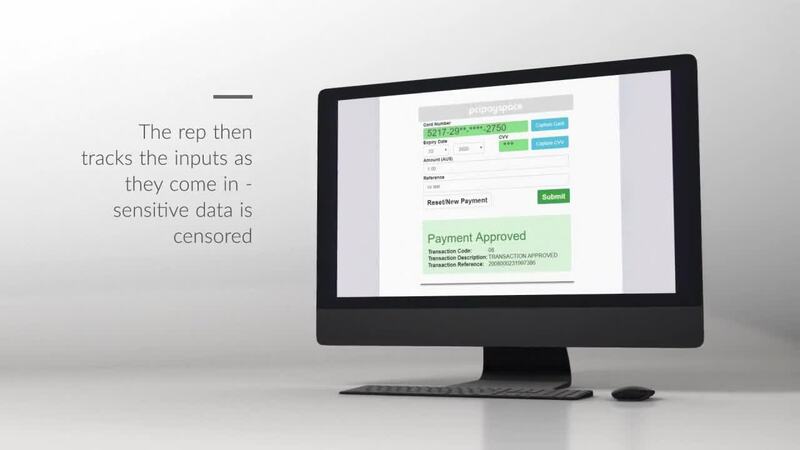 The rep can then submit the payment, or reset the process if the customer makes a mistake. In addition, the contactSPACE software suite has an incredibly versatile IVR functionality which can be used to take payments, as well as route different customer enquiries. You have complete control over your IVR logic and call flows. contactSPACE also provides a professional voiceover, to create a sleek payment process and minimise your abandonment rate. The pay-by-phone IVR solution accepts all major credit/debit cards including VISA, MasterCard, AMEX and Diners Club. Payments are instantly submitted to the Australian banking network for processing, enabling real-time authorisation using our super-secure payment processing engine. Keen to learn more about how we handle PCI-compliant payments here at contactSPACE? Fill out the form below and we'll drop you a link to our full pcipayspace brochure as a PDF.